What Does Your Patio Need? Do you have a patio without patio shade? You can't enjoy it because the sun is too hot or the rain too wet? We can help. Our job is helping you find the patio cover that fits your budget. Shade for the patio can be a simple canopy or a well placed tarp. 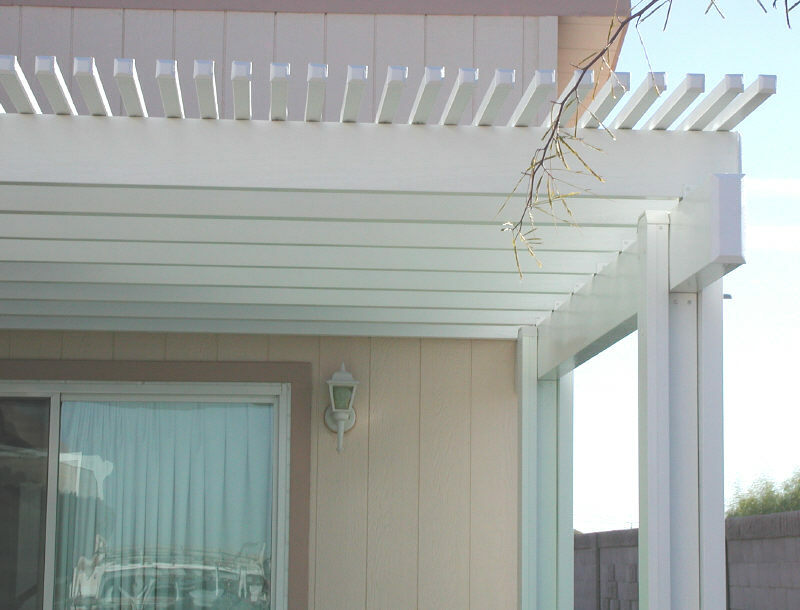 Your patio cover might be an elegant Alumawood Awning. Wood, aluminum and vinyl are all other options for patio shade. Let's explore the look and cost. On this page about portable shade you will find a 10' x 20' canopy selling for only $99.99. Also on the same page is a 10' x 10' pop up canopy selling for $119.00. Both of these canopies can be permanently mounted to a concrete slab with cement anchors or firmly attached to wood or lawn. You can easily get a few years of cheap shade and rain protection from this type of patio cover. 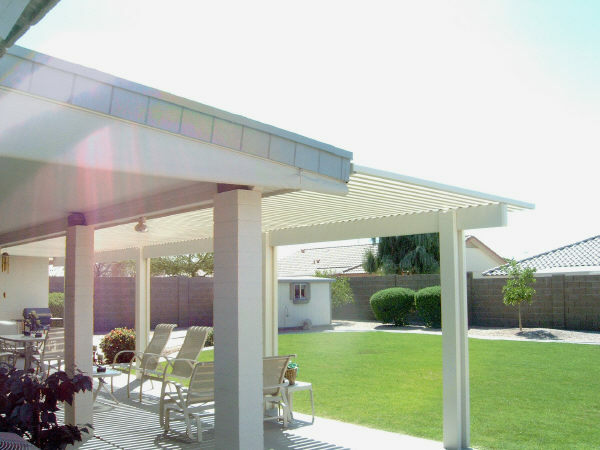 Aluminum awnings are another great way to shade a patio. Just to compare numbers lets say you want to cover a 10' x 20' patio. We sell that size aluminum awning for about $1100.00. This is the installed price in the Mesa Arizona area. 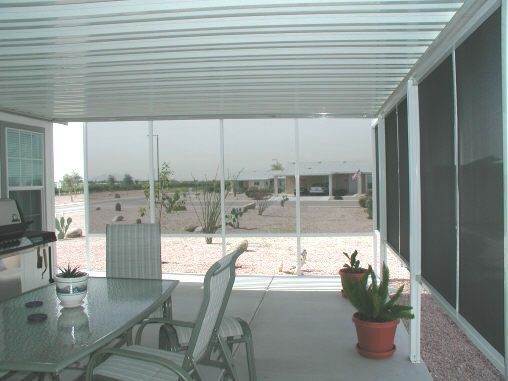 The great things about aluminum patio covers are they are maintenance free and very inexpensive. These are the type of covers I build for myself, my horses and most of my customers. Vinyl patio covers are much like our Alumawood products. A rough estimate for a 10' x 20' vinyl cover runs about $2500.00. For local vinyl cover installation companies check in with Home Advisor. The service is free and is designed to match the homeowner with qualified contractors. The Alumawood Newport and the Alumawood Laguna are both great solutions for your patio shade. Made with aluminum and a baked on enamel paint job they are durable and maintenance free. The Newport is a solid roof patio cover and the Laguna is the lattice version of the same product. The Alumawood products are manufactured by Amerimax Building Materials. An Alumawood Newport patio cover in the 10' x 20' size can be installed at your home for about $2400.00. The same size in the Laguna lattice type structure with the 1 1/2" lattice is about $2500.00. Check current prices and availability below. We sell and install in Arizona and would be happy to provide a free estimate. Follow this link to order kits that can be delivered to your door for self install. A wood patio cover is also a nice way to enhance the looks of you home. The same 10' x 20' patio shade should run around $2500.00 installed or about $1500.00 in materials from Home Depot. These are the base prices and a lot more can be spent depending on what type of house you are trying to match. The best part is you can, in most cases, match your home in every aspect. By matching your shingles, trim colors, exterior texture and painted ceiling drywall this type of patio shade can be the most expensive of all the options. The biggest advantage is it does not look like it was added on. If done properly they should look like they were built when the home was built.